Is the Senate Bill to Protect Mueller Constitutional? 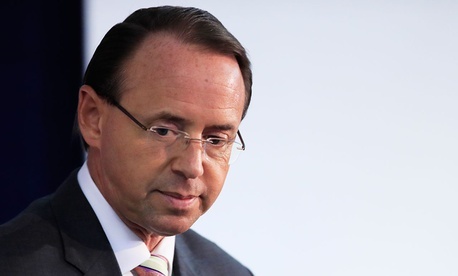 Deputy Attorney General Rod Rosenstein may be leaving the Justice Department following an explosive report in The New York Times last week that claimed he’d once suggested secretly recording President Trump and discussed invoking the 25th Amendment. It’s unclear if he’s resigning, as Axios reported, or if he’s being fired. For months, Rosenstein has been the only official standing between Trump and the special counsel’s Russia investigation, which Trump has wanted to shut down. His departure would be unlikely to immediately upend the inquiry, which is examining Russia’s election interference and a potential conspiracy between the Trump campaign and Moscow, legal experts told me, but his replacement wouldn’t be guaranteed to protect the probe. Solicitor General Noel Francisco, who has expressed skepticism of special-counsel investigations in the past and has a relatively expansive view of executive power, would take Rosenstein’s place. A law passed in 1998 would allow Trump to appoint anyone who has already been confirmed by the Senate to the deputy attorney general post, but only if Rosenstein resigns. If he’s fired, the president’s legal authority to make appointments unilaterally is much murkier. According to Axios, Rosenstein was expecting to be fired before he gave a verbal resignation to Chief of Staff John Kelly on Monday morning. His tumultuous tenure as deputy attorney general was punctuated by attacks from the president—who has called him “conflicted” and “weak”—and spats with GOP lawmakers. House Freedom Caucus Chairman Mark Meadows went as far as to file articles of impeachment against Rosenstein in July. After Attorney General Jeff Sessions recused himself from the Russia probe, Rosenstein became the one person capable of firing Special Counsel Robert Mueller directly. However, far from entertaining Trump’s characterization of the Mueller probe as a “witch hunt,” Rosenstein quietly defended the special counsel and pushed back on requests from Trump’s allies in Congress for sensitive, Russia-related documents, making him an unlikely hero among the president’s critics. Among the documents GOP lawmakers wanted, but never obtained, were notes from former Deputy FBI Director Andrew McCabe, who’d memorialized Rosenstein’s alleged comments in the Times story. Even if Mueller were fired, he could be replaced, as Paul Rosenzweig, the former senior counsel on the Whitewater investigation, noted recently. Pieces of the investigation could also get farmed out to various legal divisions. The Southern District of New York, for example, brought charges last month against Trump’s personal attorney Michael Cohen based in part on a referral from Mueller’s team. Mueller recently secured a guilty plea from Trump’s former campaign chairman, Paul Manafort, and is debriefing Cohen on all things Russia, according to ABC News. He is also writing a report that details four areas in which Trump may have attempted to obstruct justice, including Comey’s firing and why Trump wanted to fire Sessions after he recused himself from the Russia investigation last spring. Were Trump to fire Rosenstein for reasons related to the Russia investigation—for example, if he wanted to replace the deputy attorney general with someone willing to shut Mueller down—that, too, could constitute obstruction of justice, legal experts told me. With the Times story, however, Trump was handed a justification for firing that, on its face, is unrelated to Rosenstein’s handling of the Mueller probe. That’s despite reporting from The Washington Post that Rosenstein’s comment about recording Trump was made in jest in response to McCabe’s suggestion that the Justice Department investigate Trump after he dismissed Comey. “What do you want to do, Andy, wire the president?” Rosenstein asked during a meeting after Comey’s firing, according to the Post. Rosenstein, who wrote a memo at Trump’s request outlining Comey’s mishandling of the Hillary Clinton email probe, was apparently dismayed that Trump used that memo to justify firing Comey last May. Whether Trump, with the hypothetical help of Rosenstein’s successor, successfully hinders or shuts down the Russia investigation could be in Congress’s hands. Senate Republicans have rejected attempts to protect the Mueller investigation and restrict Trump’s ability to fire Mueller, including via a bipartisan bill proposed by the Senate Judiciary Committee that would have prevented Trump from firing Rosenstein for any reason other than misconduct or “good cause.” “We'll not be having this on the floor of the Senate,” Senate Majority Leader Mitch McConnell said of the bill earlier this year.